LeoVegas - Read this review before registering! The online casino LeoVegas was founded in 2012, and it is one of the most popular casinos, especially for mobile games. The casino is operated with a license from Malta, Sweden, Denmark and the United Kingdom, which are two of the strictest licenses and ensure strong player protection, and the casino has to follow strict regulations. 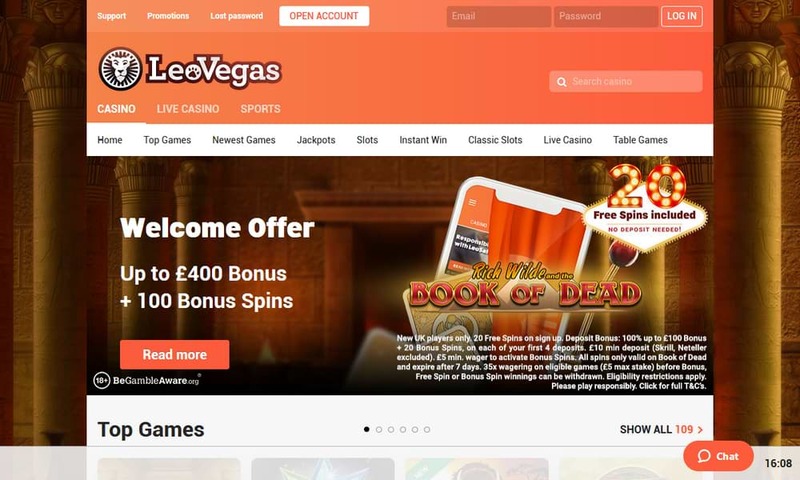 LeoVegas is a multi-software casino and offers the game for many different software providers, among them Play'n GO, NextGen Gaming, Microgaming, Yggdrasil, Netent, Quickfire, Quickspin, and many others. The casino offers their website in the languages English, Finnish, Norwegian, Danish, German and Swedish. The website is also optimised for mobile play, and you can find hundreds of games that can be played on Android, iOS and Windows phone devices. LeoVegas specialises in offering games for many different developers. These are currently 2 By 2 Gaming, Authentic Gaming, Bally Technologies, Barcrest Game Studio, Betdigital, Betsoft Gaming, Big Time Gaming, Blueprint Gaming, Chance Interactive, Concept Gaming, CORE Gaming, CryptoLogic, edict egaming, ELK Studios, Evolution Gaming, Extreme Live Gaming, Ezugi, Felt Gaming, GameVy, Genesis Games, Inspired Entertainment, iSoftBet, Just For The Win, Game Development (JFTW), Lightning Box Games, Microgaming, Nektan, NetEnt, NetEnt Live, NextGen Gaming, NYX Gaming Group, Openbet, Play’n GO, Portomaso Gaming, Pragmatic Play, Push Gaming, Quickspin, Rabcat Computer Graphics, Realistic Games, Skillz Gaming, Thunderkick, WMS, Yggdrasil Gaming and Fantasma Games. The casino is an instant casino, and you can play the games directly in the browser without having to download a casino software. The selection includes hundreds of slot machines, progressive jackpot games, scratch cards, table games and other instant games. The games are organised into different categories on the website, and the first thing that you will see are the popular slot games. These include for example Gonzo's Quest, Jack and the Beanstalk, Starburst, Sakura Fortune, Wolf Gold, Immortal Romance, Vikings Go Berzerk, Danger High Voltage, Big Bad Wolf, Book of the Dead and Twin Spin. The selection of games is incredibly large, and every player should find a game they like. The LeoVegas live casino includes an extremely large selection of live games, such as blackjack, roulette, baccarat and different casino poker variations that you can play in an authentic environment against real dealers. LeoVegas greets players with a fantastic welcome bonus package, and you can choose which one you prefer. The bonus package for the casino is up to €1,600 and 100 free spins, which is split over the first four deposits. The bonus for the live casino is 100% up to €250, and it is available exclusively for live games. You can also get a sports bonus and receive two 100% profit boosts on your first deposit for the sports book. For us casino players, the slots bonus is probably the most interesting. Keep in mind, that the bonus amount and terms can vary, depending on the country you are signing up from. This bonus in particular is for players from the UK. 4th deposit: 50% up to €400 + 25 free spins. This bonus also depends on how much money you deposit, and if you deposit less than € 50, you will get 100% instead of 200% for the first deposit. The wagering requirements for this bonus are 35 times the bonus amount. Once you have fulfilled the wagering, the remaining winnings are credited as cash. Winnings from free spins are also subject to the same wagering requirements. Before playing with bonus money, we recommend reading the terms and conditions to avoid misunderstandings. UK players also receive a free spins offer on Starburst and BerryBurst Max. This welcome offer is available to UK players only, 18 and over. To utilise the no deposit free spins a player must register. The Welcome Offer consists of a 100% bonus up to £300 + 30 spins on Starburst or BerryBurst Max. There is a minimum wager requirement of £5 for the deposit spins which expire after 3 days from the date of claiming them. Players also have a 35x wagering requirement before either the bonus or winnings can be withdrawn. Wagers are also capped at £5. Also keep in mind that players that use Skrill or Neteller to make their deposits are excluded from this offer. LeoVegas is a great casino for bonus fans. The welcome bonus not the only bonus that you can get, there are also regular promotions, tournaments and many other offers that you can take advantage of, and that will make playing at the casino a lot more exciting. LeoVegas also offers players a rewards program that will reward their loyalty. You will collect points when playing the games, and depending on how much you play you will climb up the VIP ladder. From VIP level 30 you will get additional withdrawals free of charge, faster processing times, as well as preferential customer support. Your VIP level also determines how much you can withdraw in a month, and the amount is higher with a higher VIP level. Unfortunately though, the points that you collect cannot be exchanged for cash or gifts. LeoVegas is operated with a licence from the Malta Gaming Authority, one from the UK Gambling Commission, one from Sweden and one from Denmark. These regulatory bodies ensure that the casino is following strict regulations, especially with regards to player fund protection. The casino is also regularly tested for fairness, and transactions are only carried out through secured SSL connections, which means that you can safely deposit and withdraw money. Depositing or withdrawing money is usually free, and the minimum deposit amount is €/£ 10. You have 3 free withdrawals in a 30-day period, if you want to make more withdrawals you will be charged a small fee. There are also maximum withdrawal amounts, and is the non-VIP players can withdraw up to €100,000 per month. A higher VIP level will also have higher withdrawal limit, and from level 30 you can withdraw up to €200,000, and from level 60 a maximum of €300,000 per month. Withdrawals are usually processed on the same day, but depending on the chosen withdrawal method it can take several days before you have the money in your account. Choosing an e-wallet, such as Neteller, is the fastest method for you to receive your money. LeoVegas also has a fantastic support department that you can reach 7 days a week, 24 hours a day. The friendly support can be contacted through e-mail, a UK and Ireland freephone number, an international landline number (Malta), or you can speak to them in the live chat through the website. LeoVegas deserves their reputation as one of the best online casinos that are currently available on the Internet. The selection of games is extraordinary, and especially the mobile game selection will make mobile game fans very happy. The casino is reliable, and many players are happy there. The support is great, some room for improvement is maybe that they can accept more payment methods and work on their VIP program a little bit more to make it more attractive for their loyal players. In any case, you will not regret playing at this casino, and you will most certainly have a great time with the games. The huge bonuses and fantastic regular promotions definitely make up for the small shortcomings of the casino.